Did you know that award ceremonies predate reviews? Thespis got perhaps the first award in 534BC, when he was given a live goat for his work – which, it is said, might explain why ‘tragedy’ literally means ‘goat-song’. Aeschylus won ‘Best New Play’ at the City Dionysia in Athens in 484BCE, but not a single rave write-up is to be found, and it was around 200 years later that Aristotle laid out his Poetics, establishing the importance of genre, catharsis, and really good plot twists. The medieval English theatre tradition was less likely to make awards of goats than share wagons with them – but its here that the murky beginnings of our present theatre tradition lie, a vernacular English drama that we know relatively little about, and even less regarding any medieval critical discourse around theatre as an art form. Poetics was only available to medieval writers via a Latin translation of an Arabic manuscript – and it would be later playwrights during the English Renaissance that would engage with Aristotle’s ideas, and particularly develop their own compelling tragic genre. By comparison the professional companies of the 15th century travelled from town to town. 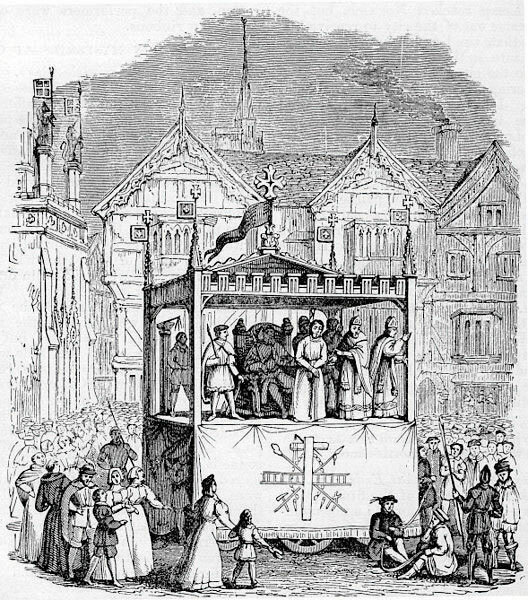 Amateur or semi-professional actors from the guilds at least had a festival when they contributed to the play cycles of cities such as York, Wakefield, Chester and Coventry – but unlike the ancient Greek model where the plays were the artistic centerpiece of the festival, the medieval Feast of Corpus Christi had at its heart the body of the crucified Christ. Shakespeare gives sly nods to both of these medieval traditions in his two greatest metatheatrical moments: Hamlet’s advice to the players, and the rude mechanicals of A Midsummer Night’s Dream. Hamlet claims that the worst examples of travelling players overacting “out-Herods Herod” – a specific reference to the overblown evil authority figure of the Passion cycle which would have been performed by guild members. With this remark Hamlet distinguishes between travelling professional players and the mystery cycle players. We can readily imagine role of ranting King Herod appearing attractive to some self-important foreman. The cultural memory (and probably practice) of cycles and medieval religious drama lives into the English Renaissance, although it only figures as humorous in Shakespeare’s remembrance. The poor mechanicals are hapless and ignorant, with only a ‘hawthorne-brake’ for a tiring house, bless them. But the carpenter, joiner, weaver, bellows-mender, tinker, and tailor represent many guilds between them, and such ad-hoc rehearsals must too have been part of preparations for cycle festivities. Although Shakespeare uses primarily secular examples when referring to previous playing traditions (the reference to ‘Herod’ is the exception, rather than the rule), the earliest surviving secular drama in English, Fulgens and Lucrece by Henry Medwall dates back only to 1497. The cycles and mysteries which survive are much earlier and more numerous. If there was secular drama in the early 15th century, it wasn’t being written down or about anything like as frequently as the vernacular biblical drama. But those biblical dramas did not solely deal with religion, or lack critical engagement with their world: the biblical scenes are made familiarly domestic where possible. For example, the “Mary and Joseph” plays of several cycles riff on a tradition that Joseph was much older than Mary to present humorous scenes of an inappropriate marriage – the holy Mary was not a fair target for fun, but her husband undoubtedly was. Contemporary fears of cuckolding were given a religious twist – the great joke is that Joseph has been cuckolded by none other than God. One version of The Trial of Mary and Joseph play in the N-Town Cycle is thought to parody the East Anglian ecclesiastical court system. The mystery, morality and miracle plays represented lay teaching of the bible in vernacular English – near translations of bible stories that would not have been heard in the common people’s language – but were also embodied and filtered through the common people’s experience. So what did medieval England think of its drama which crossed linguistic and ecclesiastic boundaries to celebrate its religion and its own culture? We know performances continued from the 14th century through to the mid-16th, sometimes planning annual celebrations of several holy-days of playing, so we can safely assume a degree of sanction – if not enthusiasm – amongst several city and religious authorities. Thanne sythen myraclis of Crist and of hyse seyntis weren thus effectual, as by oure bileve we ben in cereyn, no man shulde usen in bourde and pleye the myraclis and werkis that Crist so ernystfully wrou3te to our helye; for whoever so doth, he errith in the byleve, reversith Criste, and scornyth God. This is the core of the tretise, which extends and repeats this central theme again and again. That which is ‘earnest’ should not be treated vainly or lightly in performance. The word ‘playing’ repeatedly is used in close connection and interchangeably with ‘bourde’ as above, but also with ‘jest’, ‘jape’, ‘idle’ and ‘lust’. But this doesn’t sit neatly with the dramatic texts we have from the period. Yes, domestic relationships are presented lightly in the cycle plays, but the vast majority of morality plays and cycle plays are truly reverent, using humour in the pursuit of religious instruction. In the York Cycle’s crucifixion play, for example, the soldiers who erect the cross are hapless, blaspheming and workshy – pointedly juxtaposed with a Jesus who is, well, positively Christ-like. The words ‘pleye’ and ‘pleying’ simply come with too much semantic baggage to sustain complex critique of theatre in 1400. The tretise draws on many direct biblical references for support, which clearly seem to the author to refer to performance, but which become laughable in the context of well-rendered English translations. For instance, reference is made to the Book of Tobit (from the Catholic Old Testament) giving Sara as an positive example of a biblical woman who ‘abstained from all manner of idle playing, and from all company of idle players’, because the Wycliff Bible (1382-95) renders Tobit 3:14 as “Never with players I mingled me”, working from the Latin Vulgate’s word ‘ludentibus’, or ‘playing’. For many centuries the best readings associated this passage with avoiding ‘gamblers’. The 20th century Revised Standard Version Catholic Edition gives this simply as “I am innocent of any sin with man”. But for the medieval author, any use of the word ‘play’ had all the potential of ‘ludus’ – and so performance could sit next to and often undifferentiated from gaming, jesting, adultery, fighting, mocking and impersonation. No wonder the author of the tretise seems so horrified especially by the notion of priests indulging in biblical drama – because that very drama was indistinguishable, at least linguistically and culturally, from other forbidden activity, with an added blasphemy kicker. Another slightly more sophisticated comparison does enter the argument: the difference between ‘deeds’ – the miracles – and ‘signs’ or ‘likeness’ – the playing. … these miraclis pleying been verrey leesyng, as thei ben sygnis withoute dede, and for thei been verrey idilnesse, as thei taken the myraclis of God in idil after their owne lust, and certis idilnesse and leesyng been the most gynnys of the dyvul to drawen men to the byleve of the Anti-Crist. Right at the beginning of English theatre criticism this contrast of ‘signs’ and ‘deeds’ encapsulates theatre’s basic anxiety of influence, its chronic complex: its relationship with the real. The tretise’s language here draws on Wycliffite arguments against painting of biblical and saintly miracles. The argument goes that paintings, even when intended for devotion, are ‘signs’ which nevertheless excite only physical desire, engaging bodily senses and lusts, as opposed to the word of God, which encourages spiritual devotion on the deeds themselves. The tretise – by expressing a minority stance within the already minority Wycliffite religious culture – may well be the first English text to compare and contrast visual art and performance art. And by arguing so programmatically it also invokes arguments that have obviously been made in defence of the biblical plays – here we see that someone has at some point argued that the plays are akin to devotional paintings – or even more compellingly, that they are ‘quick books’, living texts. All in all the tretise isn’t an enthusiastic start for English theatre criticism. It embodies all of the worst qualities of poor writing about theatre – it is reactionary in its tone, imprecise in its language and hampered by a lack of descriptive ability. It casts aspersions on its practitioners, its funders and its audience – in fact everyone except the critic. Worst of all, it sees only limitations of the form, condemning them rather than celebrating the incredible things this early drama is doing. Behind the ire of the tretise winks a rich dramatic culture that could be playful and prayerful, earnest and bawdy, priestly and common, sat on unstable linguistic ground that could condemn mere play, or celebrate living words; quick books. 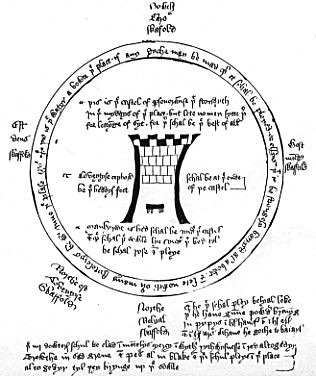 *The picture below is from the manuscript containing The Castle of Perseverence, a morality play from around the same time as the tretise of miraclis pleying. It depicts an outdoor, in-the-round playing space, with a castle erected in the middle of the space, and the suggestion of a moat – a water-filled ditch around the space. There are directions about where people should not sit (so that everyone has a good view), the colours that the Daughters of God must wear (white, red, ‘sad’ green and black) and instructions that the actor playing the devil Belial should have gunpowder burning in pipes in his hands, ears and bottom** when he comes onstage. **The Middle English word is spelled ‘ars’. I thought you’d want to know.